The Miami Dolphins have surprised everyone in the room and the television studios by reaching for wide receiver/kick returner Ted Ginn, Jr. from Ohio State. Player Evaluation: A track and field sprinter who translates his natural speed onto the football field, Ginn is a vertical receiver who loosens up the defense. Must get stronger yet a game-breaking threat every time he steps onto the field. Biography: Three-year starter and All-Conference selection as a junior after posting receiving numbers of 59/781/9 while averaging 11.1 yards on 24 punt returns and 24.4 yards on 18 kick returns with one touchdown on each. Sophomore receiving totals were 51/803/4. Returned two punts and another pair of kicks for scores as a freshman. Pos: Game-breaking skill player with home-run speed. Quick releasing off the line, has opponents playing back on their heels, and consistently stretches the field. Possesses a terrific burst of speed and runs to daylight if given the slightest space of open room. Fast laterally and makes the reception in stride. Effortlessly makes the difficult reception downfield running full-tilt. Neg: Not big, and beaten out in physical battles. Easily brought down at the initial point of attack. Has trouble handling the jam. BILL JEMPTY UPDATE: Pass me the smelling salts. Ted Ginn? Is Miami nuts? The team needs OL help, DL help, QB help, TE help, DB help, and they have Chris Chambers and Marty Booker at WR already. Booker isn’t a favorite of mine and Wes Welker is gone but still Ginn? This guy could be the next Johnny Lam Jones. He’s a stretch at #9. We won’t know the outcome on this pick for a while, but I’m betting Miami does not get the production worth this high a pick. Miami’s #1 last year hasn’t panned out yet and oh I just love the picture James has up of Ginn. 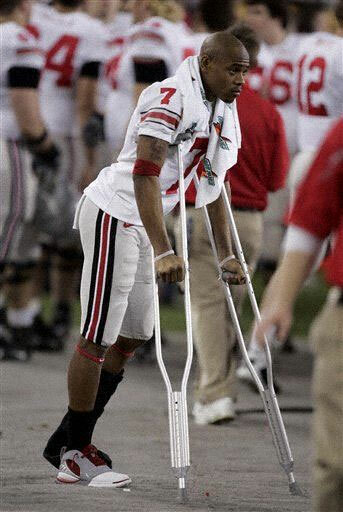 A football player on crutches, anyone remember what happened to a Dolphin #1 pick named Randall Hill? Hill was also a WR that Miami drafted in 1991. Ginn on crutches reminds me of the Hill debacle. 2nd Update- Houston takes Okoye, who I wrote just minutes before their pick that the Dolphins should this player. Miami could have had him. Sheesh! Can you say curveball? Let’s start with the good because it’s easier to get out of the way. Ginn Jr. is a playmaker with blazing speed. He can go the distance every time he touches the ball whether it’s on returns or catching the ball on offense. And the truth is the Dolphins need help at receiver and in the return game with Wes Welker now with New Englans. Now let’s get to the bad. First off, passing on Quinn was a huge mistake. Even if Miami is going to trade for Trent Green, he is a dinosaur by NFL standards and there are obviously concerns about his ability to stay healthy. Bringing in Quinn as an insurance policy and an outstanding heir apparent would have been the right move. Secondly, there are no guarantees Ginn Jr. will develop into a quality No. 2 receiver. While he has excellent speed, he ran just three routes at Ohio State so he has a tremendous amount of work to do in that area. Is Miami Dolphin WR Ted Ginn a draft bust already? RSS feed for these comments.